Kessel 105 Remix is newly arrived, flamboyant cousin of the popular font Kessel 105, created by Adrian Talbot and published by Talbot Type. It comes in 3 weights and italics, you can add personality to titling and diplay type. 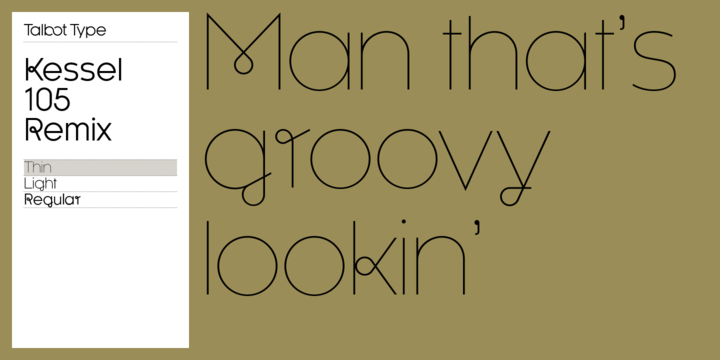 Is full of character and includes a range of discretionary ligatures to create type with an easy, flowing style. Also it has Central European language support. Cannot miss! A font description published on Wednesday, April 27th, 2016 in Adrian Talbot, Fonts, Talbot Type by Alexandra that has 3,244 views.